Winter birding in Varanger is an Eider spectacle: Steller´s Eiders, King Eiders and Common Eiders are present in tens of thousands. 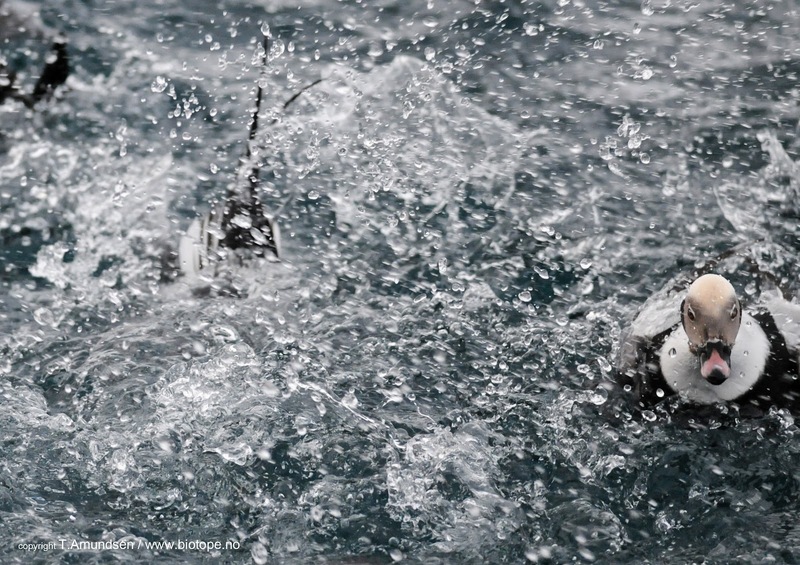 They share much of the same areas, but the various species have different preferences. 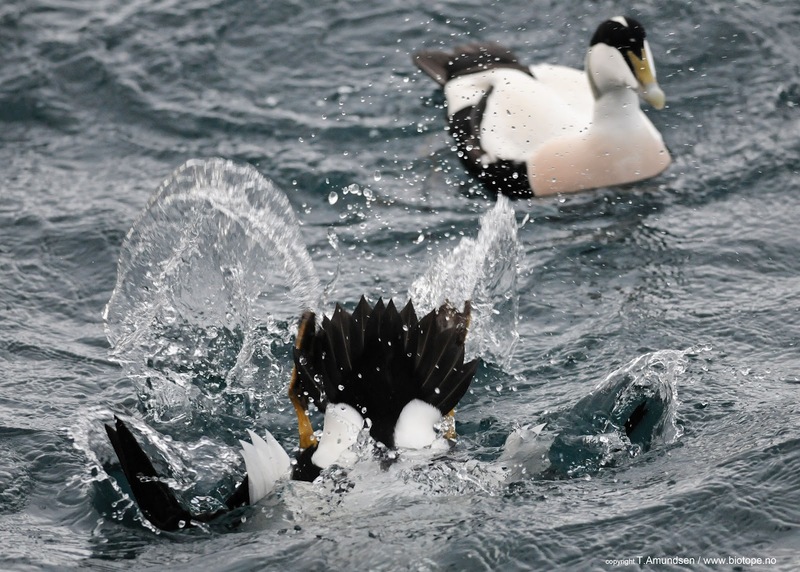 Typically the King eider favour the rougher seas. In general they stay further out then the Common eiders, prefering deeper waters. 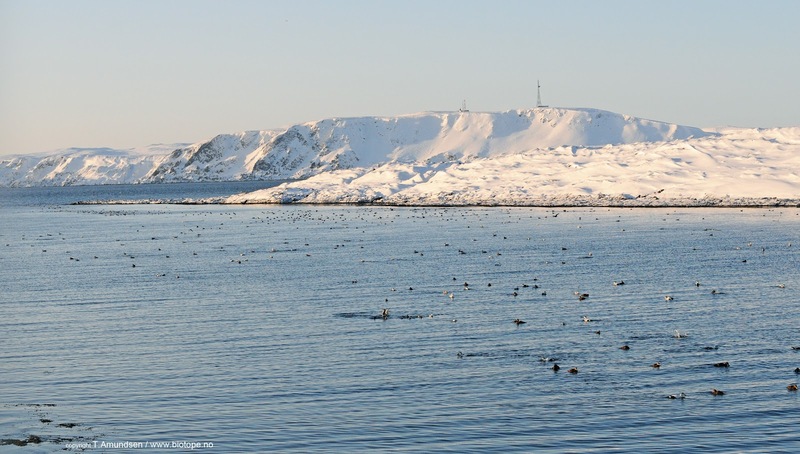 They also like the northern part of the Varanger Peninsula very much, with Båtsfjord harbour as a prime location to experience them at close range. The Stellers Eiders prefer more shallow waters, and have their favoured places from Ekkerøy to Vadsø and Nesseby - Inner Varanger fjord. 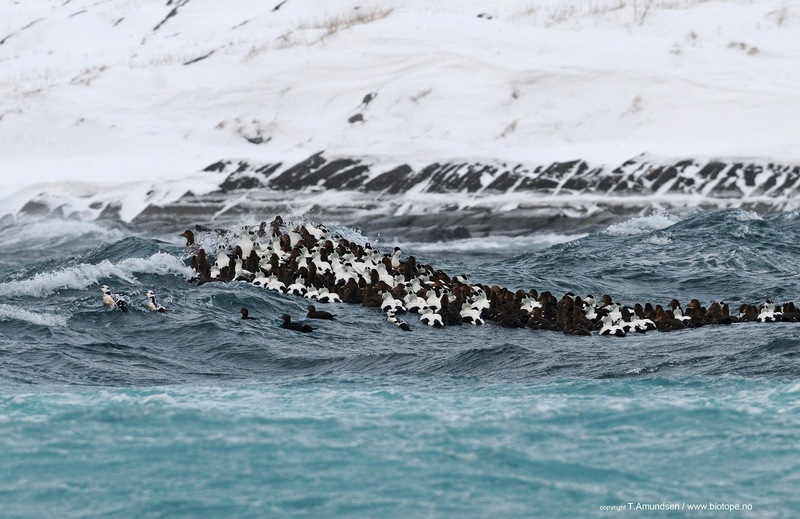 The large rafts of Common Eiders are found mostly from Ekkerøy (mid Varanger Fjord) to Vardø, outer Varanger Fjord. 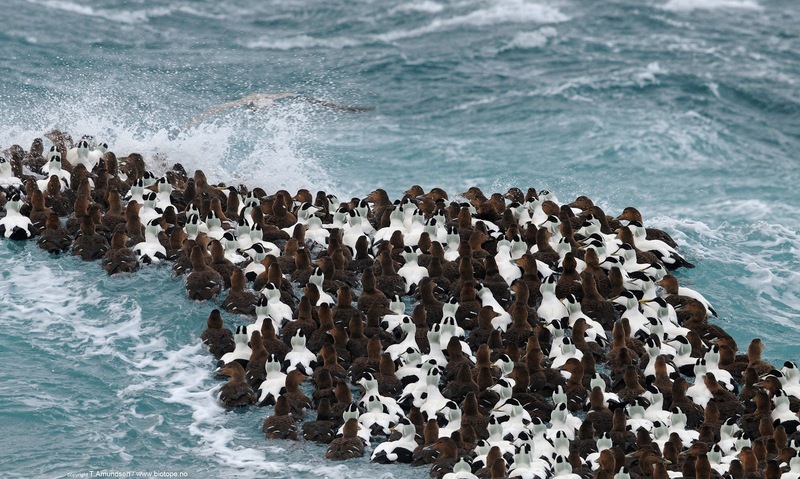 However all species are found all around the Varanger Peninsula, often in semi-mixed flocks. In winter and early spring finding them is a very easy task. 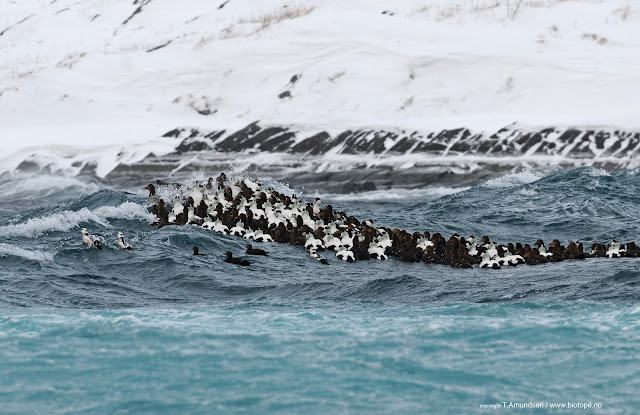 Common Eiders and Steller´s Eiders surfing the waves in gale force winds, photo taken from the Biotope office 28.02.2012. Lately we have found ourselves doing too much time working and little time birding. We have many projects going on both in Finnmark and other parts of Norway. 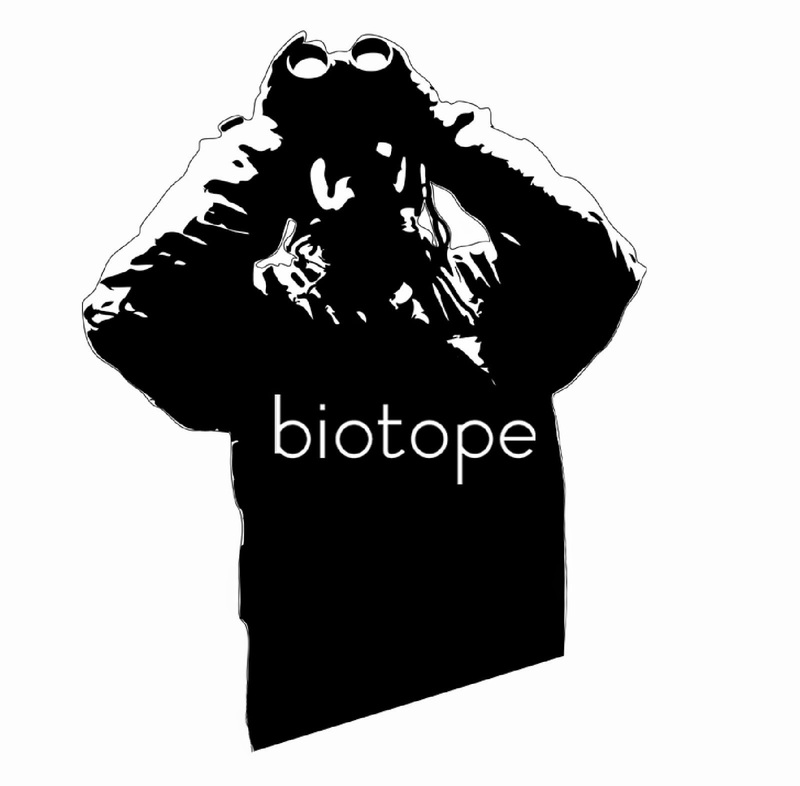 All bird-related, of course, ranging from mapping and analysing to exhibition design and bird hide / wind shelter projects. This is why we live in Varanger: we are surrounded by spectacular birdlife, so even if the work days are long we can enjoy great nature experiences from our office window. 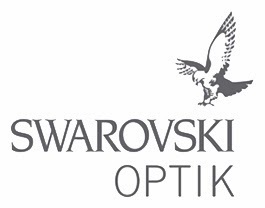 Basically I never leave the house without wearing binoculars. It is the the architect-birder tie. 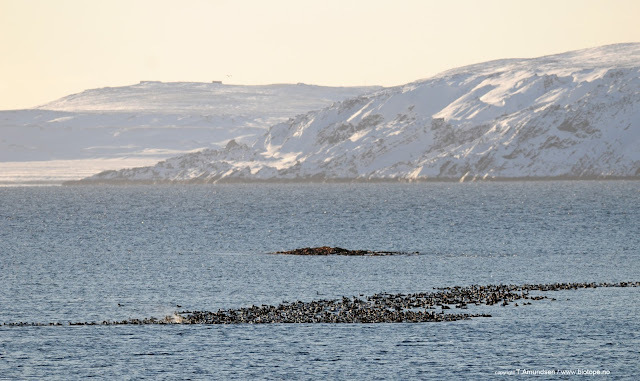 Vardø Harbour is one of Varangers best bird sites in winter. It is a 4 min walk from our office. Going for a coffee and a seaduck spectacle is a good mid day break. Photos below from Vardø harbour. 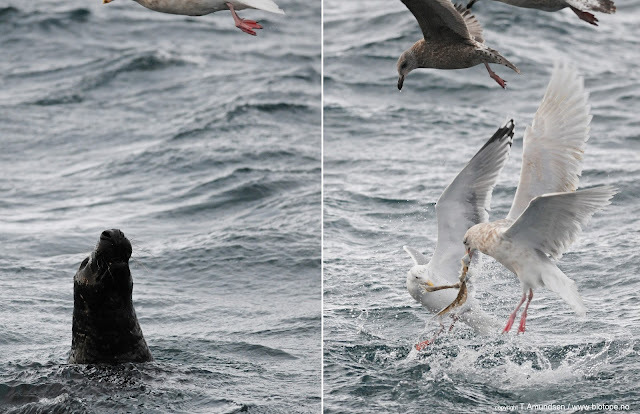 Scraps from the local fish prosessing facilities makes life in the Arctic a little easier for both birds and mammals , allthough some fighting is allways needed.. Seal vs gulls below. 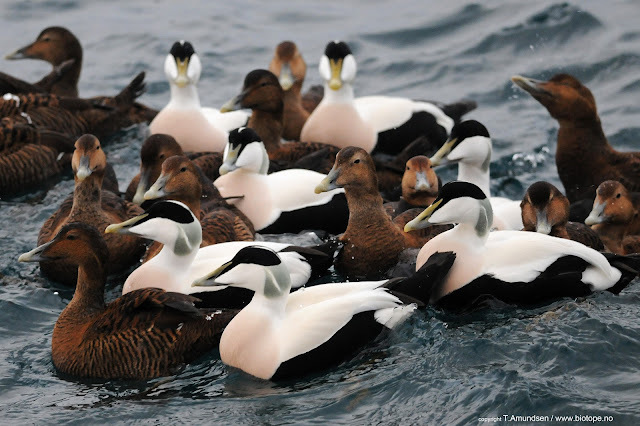 The eiders come in several subspecies (how many depends on who you ask..), based on quite distinct geographical populations. The resident breeder in Varanger is the European nominate subspecies Somateria mollissima mollissima. 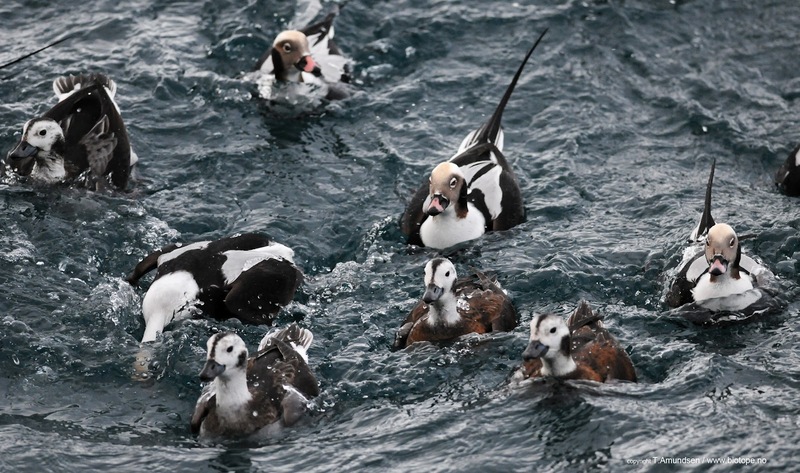 Other Eider subspecies are the faroese S. m. faeroeenensis, the Pasific ssp S. m. v-nigra, the American ssp S. m. dresseri and the Arctic ssp S. m. borealis. 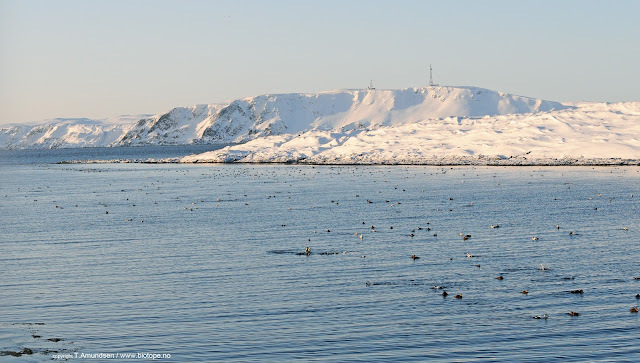 Of common Eiders wintering in Varanger most birds are of the mollissima subspecies. However a few birds are most certainly of the Arctic borealis ssp. I have yet to spend enough time to study the wintering birds in Varanger. There are often subtle differences between the subspecies, and it is a subject that is still being explored. So I will not make any bastante claims here. Separation of the borealis and mollissima subspecies is a subject that is still being explored. I hope to find more time to look into this in the near future. 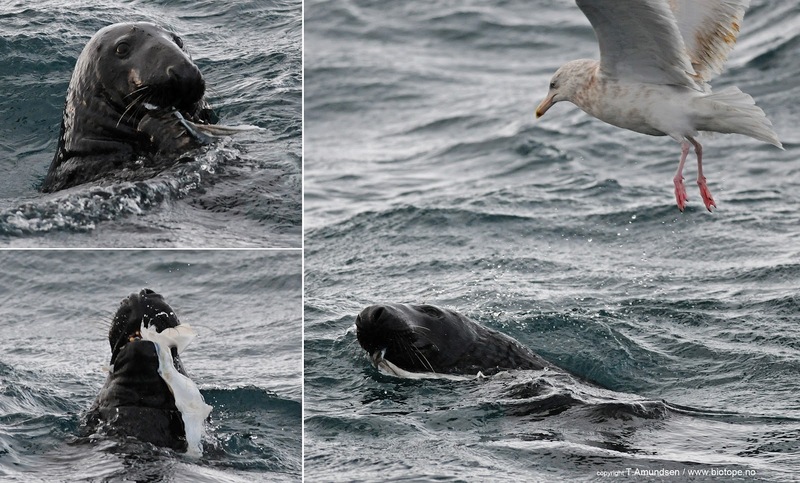 There is not much material to find on the web on separation of the Eider supspecies (but obviously hunters have a scientific eye too: eider ssp id-article). Anyone with an interest in this (f.ex for id-articles) can freely use any of the Eider photos in this article for such purposes. More photos can also be provided (drop me a mail for high res pics). There are probably lots of intermediates around, and certain identification is not allways possible, but I am sure that several of the Eiders in Vardø harbour are of the borealis subspecies, probably from Svalbard. 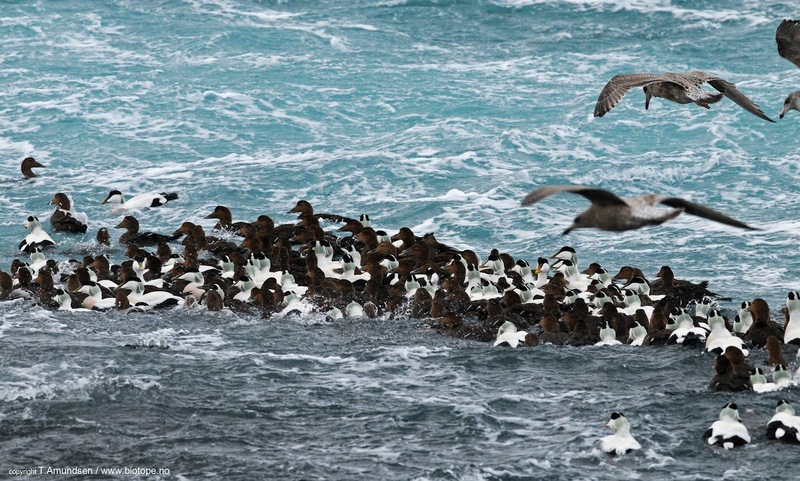 For now I will have to settle with admiring the rafts of Eiders around Vardø island, and how they cope with gale force winds and heavy waves. Staying close together is a good strategy in the Arctic. Photos below are taken 28.02.2012 from outside our house in Vardø - the Biotope office. 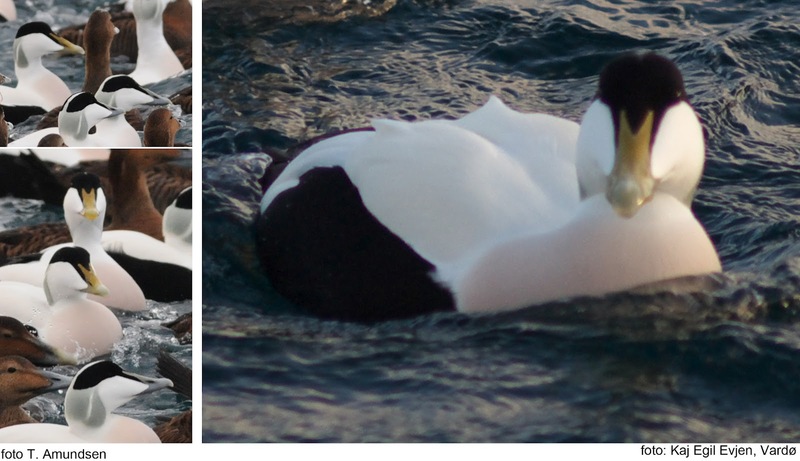 Eiders feeding on mussels, allways with gulls looking to grab an easy snack. 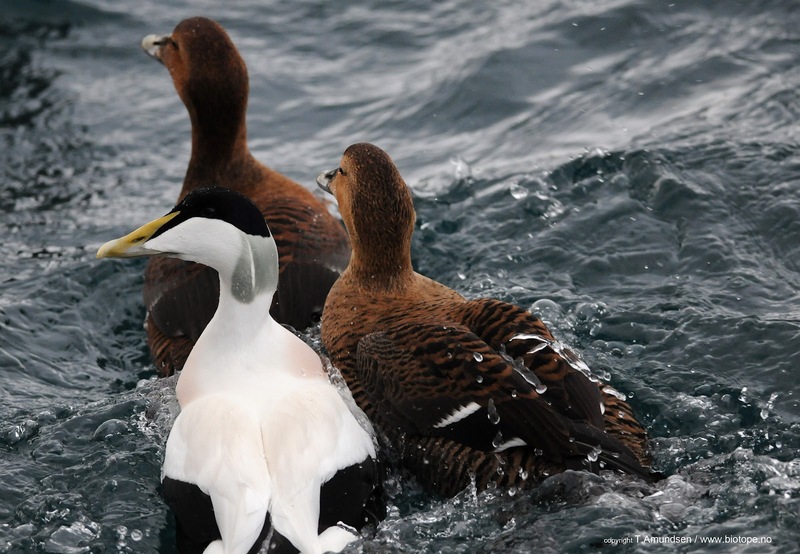 Have a look at the bill colour on the eiders: from deep yellow to pale green-grey. Elin took the video clip below from inside our office, with a view through salt covered windows. 45 sec clip, taken with a leica compact camera. That is me on the snow on the shore having my lunch break, and taking the photos for this article. Another fine day at the office..
By the way we will be back soon with more info and good news on the Arctic GullFest.